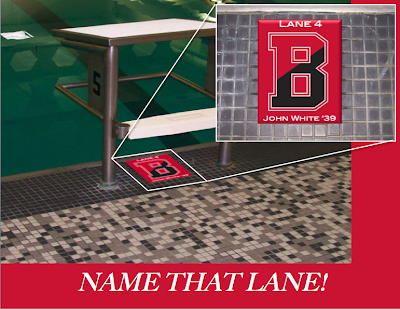 The Bobcat Chronicle: Name That Lane! In an effort to purchase new blocks I mentioned a "name that lane" idea earlier this year. We are now up to 7 blocks "claimed" and enough donations to make this a go! I hope to make sure everyone has the latest information so please don't hesitate to call or email if you have questions. Basically, we've set up a program that allows a $5,000 donation to give you the naming rights to one of the lanes at Tarbell! Feel free to get together your classmates, make a donation yourself, or have a block named after someone deserving. A brand new Keifer Racing Block will be perfect alongside our new lanelines and backstroke flags. Remember, there is only 1 lanes remaining! Contact Coach Casares quickly if you are interested in learning more; 207-786-8264 or pcasares@bates.edu.